here are a few different treatments that can be called ‘Same Day Smile Makeovers’. Composite bonding additions and CEREC crowns and veneers can both be completed in a single appointment. There are a few different treatments that can be called ‘Same Day Smile Makeovers’. Composite bonding additions and CEREC crowns and veneers can both be completed in a single appointment. The key thing for any same day smile makeover treatment is thorough planning. If it is important to you that there is no temporary stage, or time without a tooth then gaining your smile in a day may be the right treatment for you. Everything you need to know BEFORE starting treatment! What are best, crowns, veneers or bonding? How will I know what I will look like after treatment? How do we complete a smile makeover? To make sure we understand what you would like and what would work in your mouth we will start by taking a series of photos. Smile imaging can help us understand what is possible and also what you are looking for. We will often then make a 3D model of your teeth to plan what changes will work best for you. Any designs made here we can also ‘mock up’ in your actual mouth, so you can get a feel for your new smile. We will spend time to make sure that it really is the smile you want. 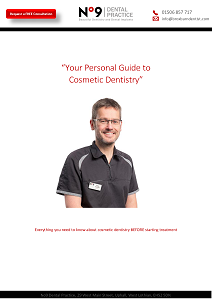 As one of only 2 dentists in Scotland to be Accredited by The British Academy of Cosmetic Dentists, you can be assured that your treatment at No9 with Peter Buchan will be planned and executed to the highest standards. Working with an award-winning team and technician you can be assured of excellence at every stage of your treatment. To change your smile we can use invisible braces to move your teeth, or we can change their shapes using ceramic crowns or veneers. If the change in shape is fairly small we can also make composite veneers using white filling material. Missing teeth can be replaced using dental implants or bridges. How will I know what treatment is best? You will have time to discuss treatments with more than one member of our team. While our dentist cannot make a decision for you he can advise of any pros and cons of different treatments, allowing you to make as informed a decision as possible. How much will a cosmetic smile makeover cost? Your treatment plan will be completely individual and so therefore will be the price. We do have a price list, so that you can have an idea of the costs for some treatments. You will always be given as many options as we feel are possible. Sometimes you may not need as much work as you think to achieve the look you are after. We also provide interest free and longer term low-interest finance options. Will a smile makeover be painful? The honest answer to this is no! However many people suffer from dental phobia, or a milder anxiety that there will be some pain involved. We do understand that dental fear and anxiety are very real and we will work with you to help you overcome this if it is an issue for you. Patients we have worked with in this situation have always commented afterwards how amazed they have been that there has been no pain involved. If you have any concerns about this we will be happy to take the time to discuss these with you. Will a makeover be something extreme that will leave my teeth less healthy? While a smile makeover is a cosmetic dental treatment your oral health is always our primary concern. We will advise you on long term dental hygiene and your dentist will carefully help you weigh up your long term health if you are considering preparing or extracting any teeth. We will not encourage any ‘quick fix’ which may cause you problems in the future. We will always treat you to create the heathiest mouth for your long-term health, even if your concerns are more cosmetic. Porcelain Veneers are thin ceramic shells created to fit perfectly onto the front of your tooth. They can be a beautiful way to restore a broken tooth or to change the shape of a healthy one. A smile we are happy with can totally change the way we feel about ourselves. Sometimes this can be an extreme cosmetic makeover, while other times just small changes can make a huge difference. Nearly everyone would like to have brighter, younger, healthier looking teeth. It is one of the most cost-effective and least invasive ways to improve your smile. There are many products in shops or the internet claiming to whiten teeth. Porcelain Veneers are thin ceramic shells created to fit perfectly onto the front of your tooth. They can be a beautiful way to restore a broken tooth or to change the shape of a healthy one. Veneers can also be made of a composite material.